How do I choose a good volleyball Club? Full disclosure: I am writing this as a member of the Executive of the Maverick Volleyball Club and a member of the Board of Directors for the Ontario Volleyball Association. As a parent and athlete you always have the option to choose which Club you play for. Don’t be fooled by early offers of making team rosters, one Club try outs starting up late as a sign that they are not organized, nor should you be attracted by websites and uniforms. You need to do your research and ensure that you have objective criteria in place to evaluate where you should be playing. Playing costs on some teams are substantial due to travel and off court programs (i.e. strength and conditioning) so evaluate the Clubs wisely and objectively as if you were purchasing something that you will have to “live” with for 8 months this season. Volleyball Canada (VC) and the Ontario Volleyball Association (OVA) have recently taken great steps in trying to help athletes and parents make an informed decision. The ultimate objective of this program is to strengthen volleyball’s club system by rewarding, recognizing and enticing clubs to increase their capacity and better serve the volleyball community. Basically, VC has set up criteria that member Clubs have to meet in order to obtain this certification. VC established criteria and they separate them into two categories; mandatory and optional. Under the mandatory category there are five criteria, mostly dealing with Club structure and sound governance models that Clubs have to meet. In essence a Club’s application will not be considered further if they do not meet all five of the criteria. Once all the five mandatory criteria are met VC will look at the optional category where Clubs will be evaluated on ten criteria. In order to obtain this accreditation the Clubs will have to meet seven of the ten. The ten criteria focus on the “product” offered by the Club, namely grassroots volleyball development, certified coaches, gender balance in coaching, good “citizens” in the volleyball community and a track record of producing high end volleyball athletes. In my opinion, this accreditation is a step in the right direction as long as the parent/athletes use this tool in their objective decision making process (discussed later in this article). In the winter of 2013 the OVA attempted to implement the Tryout Window policy . After much feedback from OVA members and Clubs the policy was referred to an OVA committee for their review and possible re-introduction if warranted in the future. I truly believe that the intent of this policy had the players’ best interest in mind. “Competition to attract athletes, especially in areas with a lot of clubs is becoming increasingly fierce. It has become more common for clubs to set their tryout dates earlier in the year and to ask athletes for non‐refundable deposits in order to be considered for a team. For players, the tryout period is already one of the more nerve racking times of the season, not only are they trying to secure a spot on a team but they are faced with having to make quick decisions about playing on one club without knowing what options may be available to them on another. To help alleviate some unnecessary stress and provide athletes with an opportunity to gather information about potential playing opportunities, the OVA is considering implementing a “Tryout Window”. “Tryout Windows” have recently been adopted in other provinces and have been well received by their membership. Starting in 2013, the OVA is considering not allowing tryouts to commence until September 9th and not allowing athletes to sign with a club until the “Signing Date” which will be September 30th. During the “Tryout Window” of September 9th to 30th, clubs will only be able to charge a tryout fee and will not be able to offer a spot on the team or collect any deposits for the season. Think about this logically with this example. You’re currently an owner of a Ford car and happy with it but your lease is about to expire on August 31, 2013. On August 15, as a wise consumer you begin your search for a new car and look at other manufacturers’ offerings in the same class as your current car. The first dealership that you go to, a GM dealership, offers you the comparable car to your current Ford at a price that is $5,000 less than the advertised Ford car but in order for you to get that price they are requesting that you deposit $2,500 and that deposit is non-refundable. Would you jump on that deal not knowing what Ford or other manufacturers will offer to you? The proposed OVA policy was addressing that exact problem. Another phenomenon with OVA Clubs in the same geographic region is that they adopt the “first to market strategy”. This simply means that they schedule their try outs months, weeks or days before their competitors and offer the “GM deal” to the athletes before they get a chance to look or try out with other Clubs. The policy the OVA was proposing wanted to implement a date where athletes were free to explore their options (in our example lease expiry of August 31, 2013) prior to having to commit to one choice. I heard from members of the OVA that this new policy was going to handcuff the Clubs in ordering their uniforms, equipment and planning for the season. To some extent I agree that it is an inconvenience to the Club administratively but who are we here for? The best for the athletes or making sure things run administratively well for our volunteers and Club Board members? Our Club has instituted a practice where we don’t collect fees or make an athlete sign an OVA player registration until a Parent Meeting occurs post the team being selected. Those parent meetings usually occur in the first or second week of October. We truly believe that if any athlete wants to explore their options they are welcomed to and should be encouraged to do so. Asking an athlete to commit to the team and Club so late admittedly does make us sweat not because we are afraid to lose them it’s more that we can not provide the parents of those who have already committed with the projected Club fee costs until usually the third week in October. We are waiting for the first deposit cheques from the athletes to be submitted along with OVA player registration forms. As a not for profit, every dollar of an expense item is shared equally amongst the membership hence we can’t provide what the costs per player will be until we know how many members/athletes we have to share the costs with. I used our practice of player commitment as an example not to say it is better than others but to illustrate that Club teams can still be formed and allow athletes to explore all their options. Have we lost older players to competing Clubs because our practice or younger athletes who are new to the sport and happy to have been offered a spot on their first competitive team? Absolutely we have. Does it bother us? Not at all. That is not to say that we are happy when we lose an athlete(s) and don’t care. If we caused them to make that decision based on an action or inaction on our part it allows us to review it, address it or modify it for the future. Like Ford, GM, Ferrari or Lamborghini, we know we can’t get everyone we want in our Club, we simply build a product we believe in and are proud of and if we are lucky enough to have parents/athletes who also believe in our product and want to be a part of it then that is all we can ask for. I would like to take this opportunity to share with you my approach in making decisions. I’m not saying my approach is right or wrong, better or worse than yours it’s simply MY approach. I also use "MY" loosely as I picked this process up somewhere along the way and would give full credit to the author if I remembered who and where I got it from. So if you are the original author of this process here is your credit and my apologies for not recognizing. The important thing to take away from this is that you need to come up with an objective decision making process/approach that works for you and implement it for yourself. The decision is hard enough without having to put feelings, emotions and peer pressure into the equation. Step one and two are self explanatory however what is important here is that the decision to be made is written down along with the goals of the athlete long term or short term. Step three is perhaps the most difficult part of the process not because the information is not available, on the contrary; too much information is provided by the Clubs packaged in so many different ways. The difficulty is for you as an athlete/parent, to get the “apples to apples” comparisons. If you establish the criteria and make sure that they are “normalized” or made so that they can be comparable to each Club you’ll be in a much better position to make an objective decision. 1. How many hours of on-court training will I get? 2. Do they offer off-court training? 3. What are the coaches’ certification levels? Experiences? 4. What is included in the cost as a member for the team? What are extra costs? Step four is perhaps the most important step as you now have to tie in the objective measures of the options with your goals as an athlete. In the example above the 15U athlete is behind technically with his/her peer group so he/she may need to be in an environment where the coaches and athletes will push him/her to accelerate his/her development and/or are understanding of where he/she is at in his/her developmental stage. Step five is the “sober second eye” test. Can you defend your decision to anyone if asked to? Is your decision going to help you accomplish your goals? If you can defend your decision with an objective measurement other than they have better uniforms or they are planning a tournament to Brazil and I have never been then you made the right decision. If that is your answer, you made the right decision. I really wanted to avoid providing a list of questions that parents and athletes could ask the Club but my colleagues insisted that some examples be provided in case you’re a parent of a 13U aged athlete or are new to the sport and have no idea which questions to ask a Club. On the advice of my colleagues and with the goal of assisting you to make an informed decision here are a few suggestions, again the list is not exhaustive but a good starting point. 1. 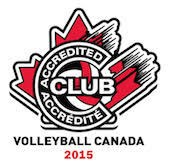 All the Volleyball Canada Accreditation questions are an excellent starting point as it addresses the governance model of the Club, their development programs and their overall service to the volleyball community. (Link: http://ontariovolleyball.org/images/Club Accreditation Criteria.pdf). 2. What is their Club’s philosophy on athlete development? Playing time versus practice time? 3. What is the Club’s track record in developing athletes to the next level? Finally, add in the questions that are vital to you making your informed decision. Best of luck to all the athletes in your tryouts and seasons whether you’re in a Maverick uniform or not!